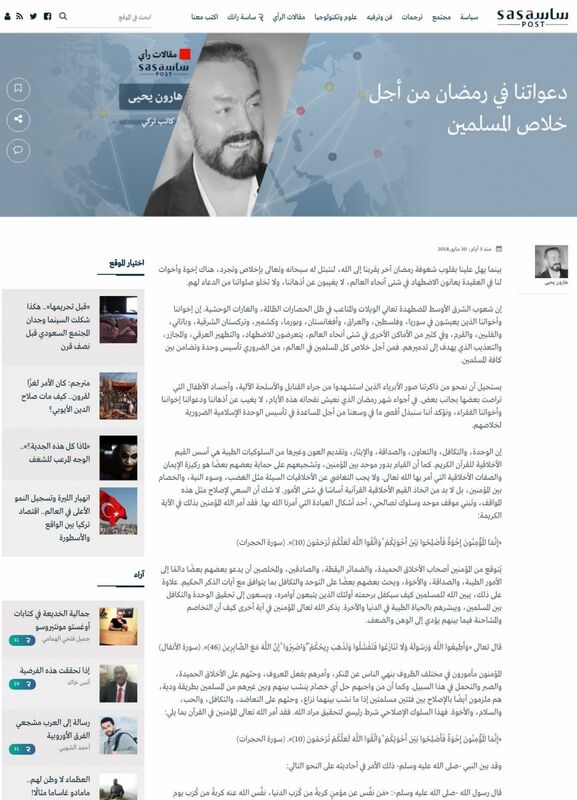 Arabic language international political news portal Sasapost publishes Harun Yahya article. 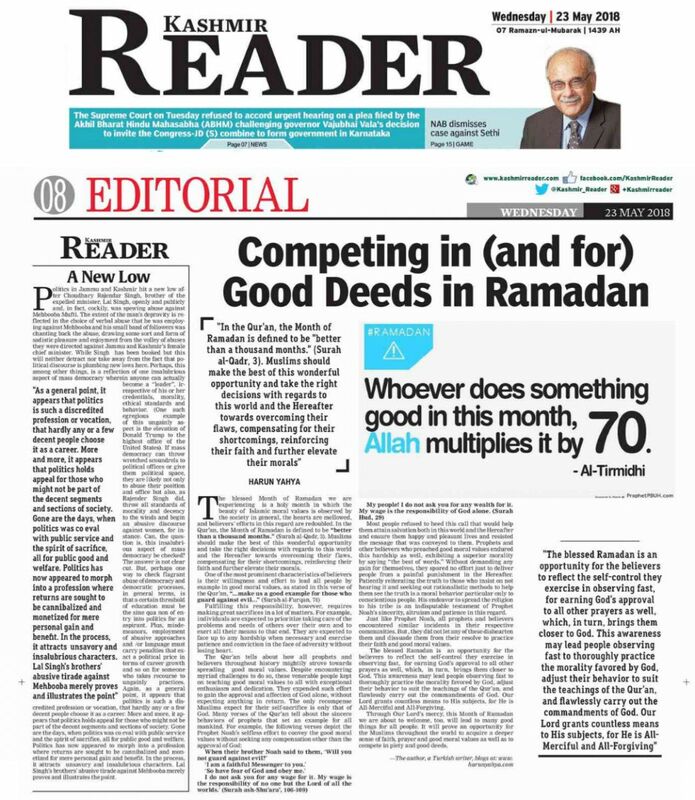 English daily newspaper published from Srinagar, Jammu and Kashmir, Kashmir Reader publishes Harun Yahya’s articles. 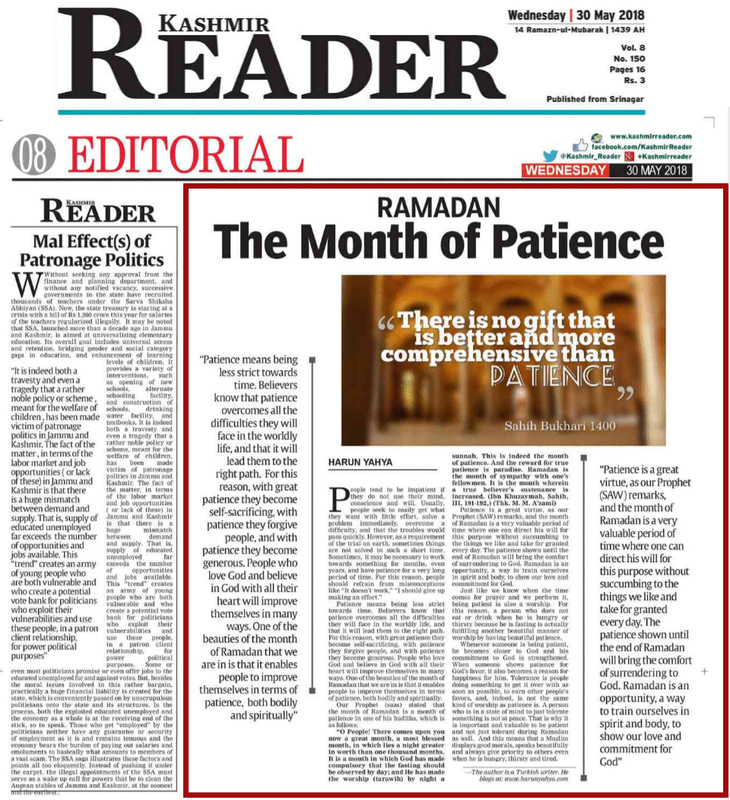 ]]>http://sheikhnazimalhaqqani.com/en/Harun-Yahya-Impact /275899/ramadan-the-month-of-patiencehttp://sheikhnazimalhaqqani.com/en/Harun-Yahya-Impact /275899/ramadan-the-month-of-patienceSun, 08 Jul 2018 20:23:29 +0300How will the Ramadan be remembered this year? 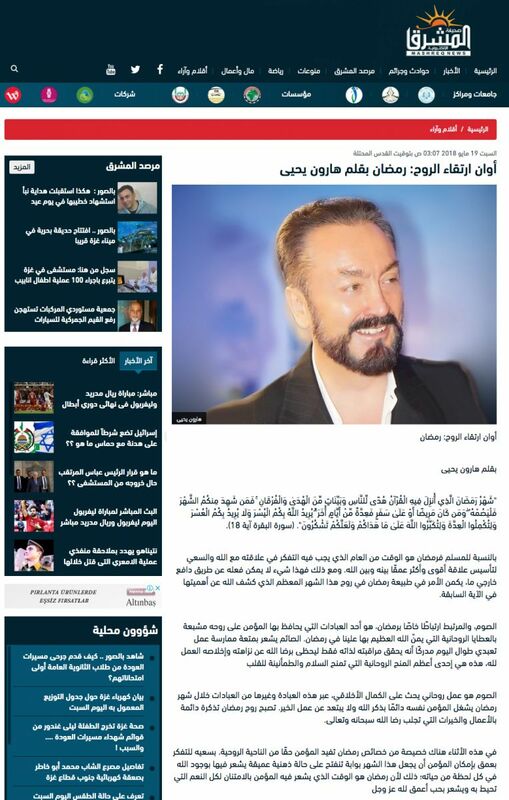 A Palestinian based news agency providing up-to-the-minute news, both local and regional, Mashreq News, publishes Adnan Oktar's articles. 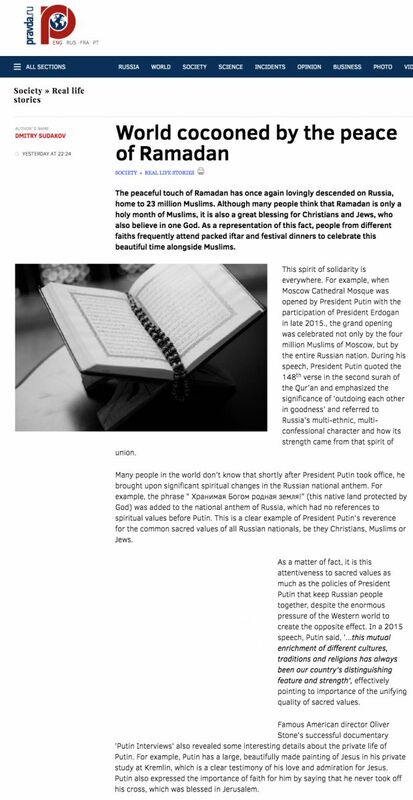 ]]>http://sheikhnazimalhaqqani.com/en/Harun-Yahya-Impact /275897/how-will-the-ramadan-behttp://sheikhnazimalhaqqani.com/en/Harun-Yahya-Impact /275897/how-will-the-ramadan-beSun, 08 Jul 2018 20:08:24 +0300How will the Ramadan be remembered this year? 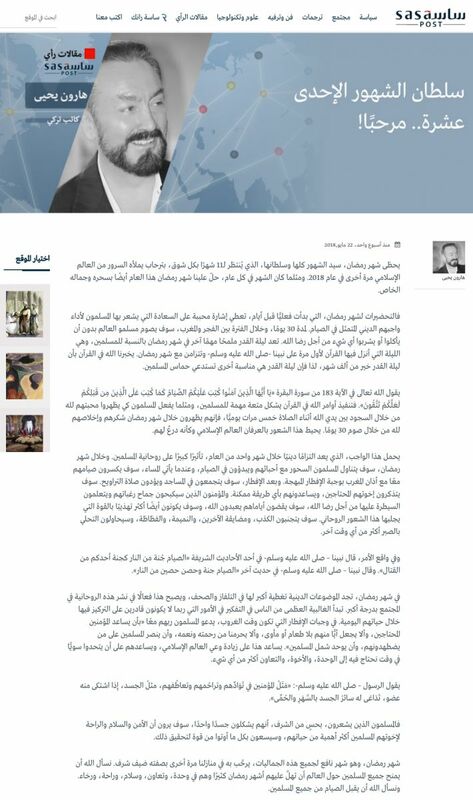 The Global Institute for Democracy and Strategic Studies, a think-tank from US, publishes Harun Yahya's articles. 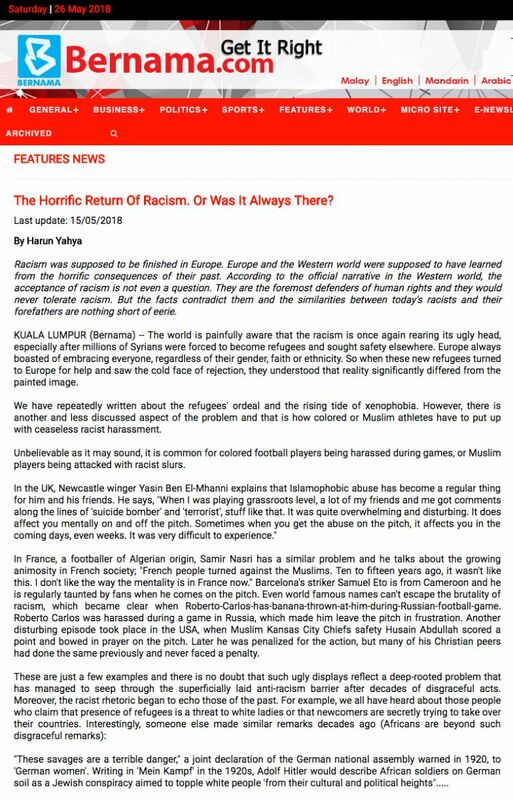 International news website based in New York – USA, News Rescue, publishes Harun Yahya’s articles. 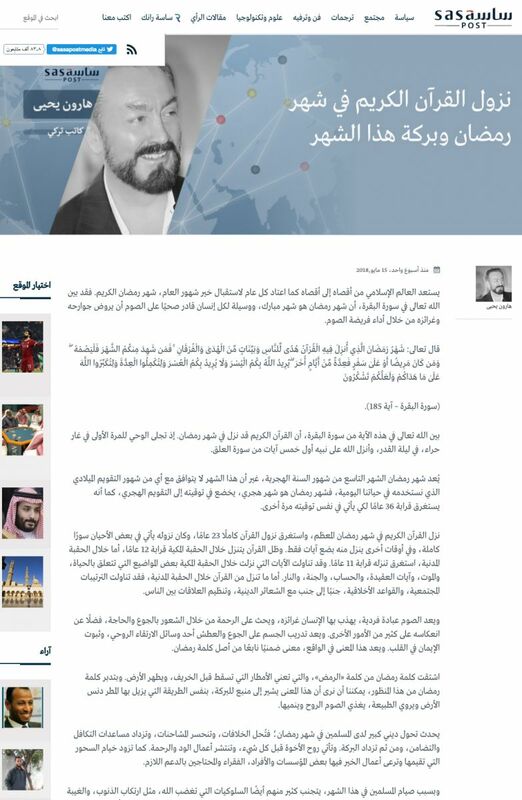 123 News, a newsportal from Egypt, publishes Harun Yahya‘s articles. Geopolitica is an independent think tank organization consisting international network of people from Russia. 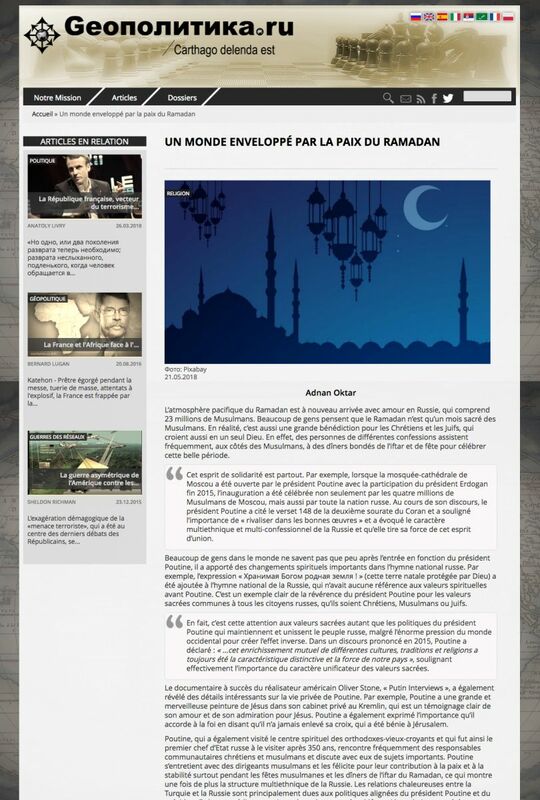 Harun Yahya’s article, “World cocooned by the peace of Ramadan” is published at the French publication of Geopolitica. ]]>http://sheikhnazimalhaqqani.com/en/Harun-Yahya-Impact /275551/world-cocooned-by-the-peacehttp://sheikhnazimalhaqqani.com/en/Harun-Yahya-Impact /275551/world-cocooned-by-the-peaceMon, 02 Jul 2018 15:54:45 +0300How will the Ramadan be remembered this year? With over 14,5 million followers on Facebook, Hespress is one of the most important and influential newspapers in the Middle East and North Africa region. 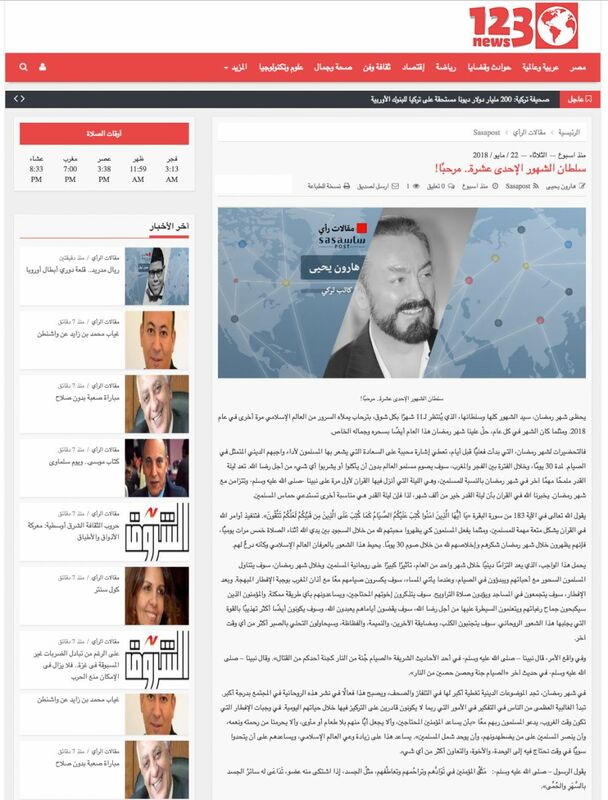 One of the most visited news agency in Morocco – Hespress, publishes Harun Yahya‘s articles. 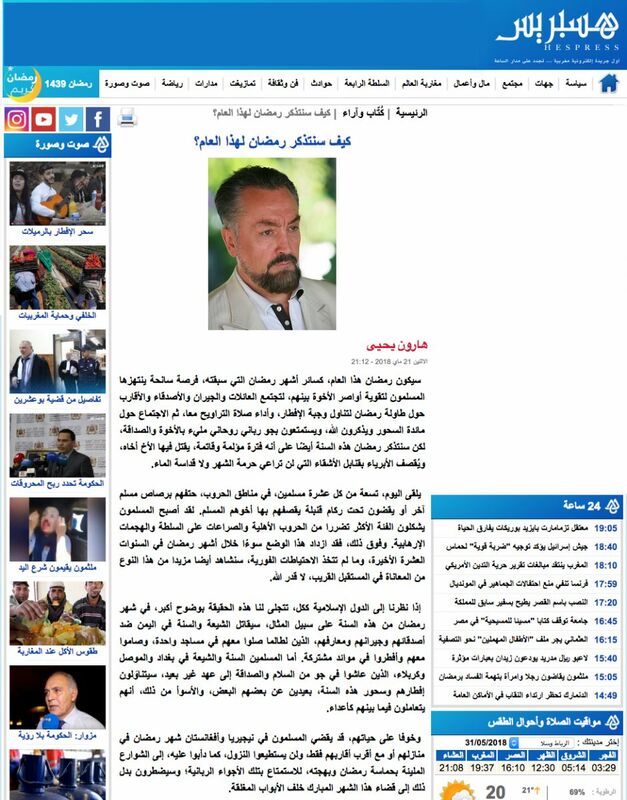 Russia’s prominent daily newspaper Pravda publishes Harun Yahya’s articles. ]]>http://sheikhnazimalhaqqani.com/en/Harun-Yahya-Impact /275545/time-of-elevation-of-thehttp://sheikhnazimalhaqqani.com/en/Harun-Yahya-Impact /275545/time-of-elevation-of-theMon, 02 Jul 2018 15:13:34 +0300The Sultan Of 11 Months, Welcome! The official national news agency of the government of Malaysia, Bernama which was established in 1967, publishes in 5 languages, including Malay, English, Mandarin, Arabic and Spanish. Most of the news media in Malaysia and Singapore and international news agencies subscribe to BERNAMA, which is based in Kuala Lumpur. 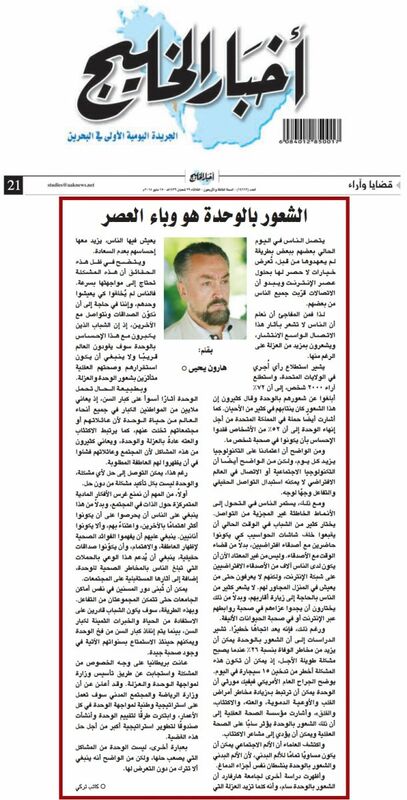 Bahrain’s one of the oldest daily newspaper, Akhbar Al Khaleej, publishes Harun Yahya’s articles. 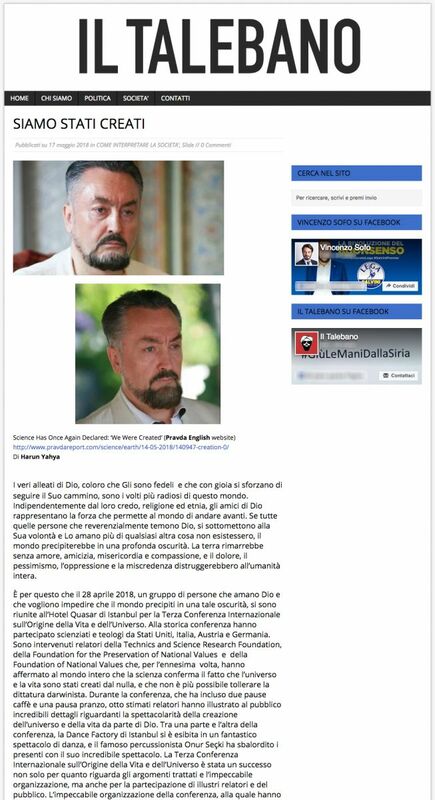 The Italian institute Il Talebano which focuses on the protection of the spiritual and moral values of the society published Harun Yahya’s article. 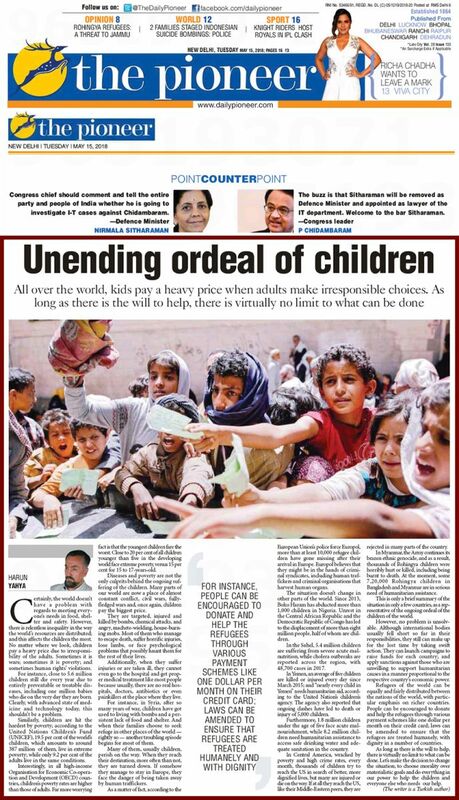 The second oldest English language daily national newspaper in India The Pioneer published Harun Yahya’s article. ]]>http://sheikhnazimalhaqqani.com/en/Harun-Yahya-Impact /275521/the-quran-being-sent-downhttp://sheikhnazimalhaqqani.com/en/Harun-Yahya-Impact /275521/the-quran-being-sent-downMon, 02 Jul 2018 01:20:35 +0300The Horrific Return Of Racism. Or Was It Always There?